Here’s a quicky for ya… Looking for a fun new side dish that’s super easy? Well look no further, this one’s delicious! Ok guys, so this one is super easy. First and foremost, get your peeled potatoes boiling. In a second sauce pot melt down your butter at medium high heat and add your cauliflower, 1/3tsp salt and 1/3tsp pepper. Cook the cauliflower until it starts to brown, then add your heavy cream and grated parmesan. Reduce the heat to low and allow to simmer uncovered for 10 minutes, stirring periodically. To combine everything you could use a stand mixer or hand mixers… I used the latter. In a large bowl combine your boiled potatoes, sautéed cauliflower & parmesan cream, sour cream, shredded cheddar, salt, pepper and garlic powder and whip together until moderately smooth. There will likely be some small chunks from the cauliflower, which is fine. Top with the crispy bacon and chopped scallion, and enjoy! Obviously this is a recipe that you can play around with to make your own. More cheese, less cheese, different types of cheese, top with cheese, add sriracha, mix the bacon in… whatever you want. Another idea would be a bake your potatoes skin on instead of peeling and boiling, then core them out and set the skins aside. Put the completed puree in the skins and put back in the oven for some twice baked puree. Hmmm… I might need to do that one next time! 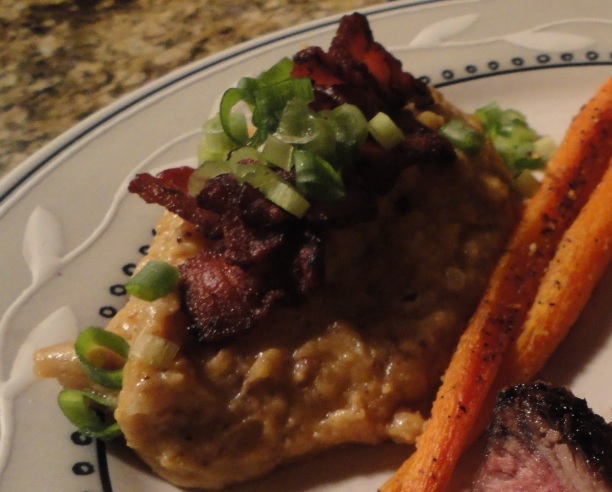 Tags: bacon, cauliflower puree, loaded potato, mashed potatoes. Bookmark the permalink.